Your favourite psychedelic adventures told live! 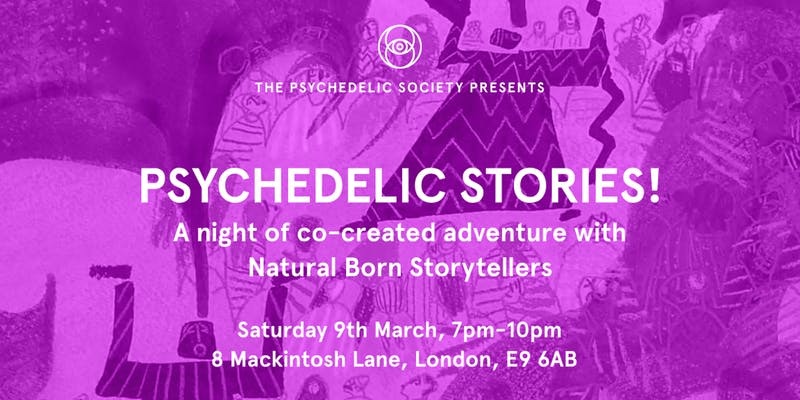 In partnership with the Psychedelic Society who believe that the conscious use of psychedelics can help create a more compassionate and joyful world, we bring you a night of psychedelic stories. Come hear stories about beautiful and deeply meaningful experiences alongside tales wasted opportunities, experiments, missions, great times, bad times, lessons learned, kaleidoscopic fun, scientific breakthroughs or life-changing realisations. We'll be sharing our personal tales from our experiences with psychedelics and you'll have the chance to hear stories from scientists, addicts, day trippers, storytellers or your best friends. Anyone is welcome to share a tale, so come along and enjoy the ride. If you have a story you'd like to tell tonight or on any of our upcoming themes, please visit Natural Born Storytellers and fill in the form with an outline of your story.